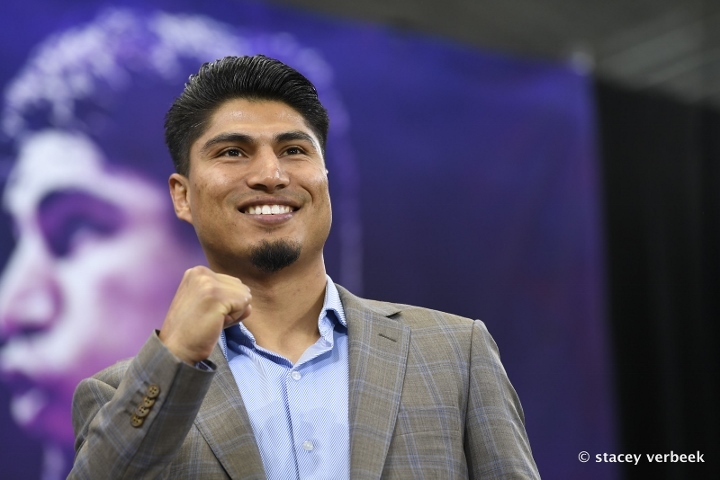 Mikey Garcia has already won. I would’ve advised him not to move up in weight to challenge IBF welterweight titleholder Errol Spence, just as his family members (including brother and trainer Robert Garcia) did. Spence’s combination of size and apparent ability would seem to be too much even for a proven star like Garcia to overcome. The size difference is daunting. Garcia still holds a 135-pound title and has never fought at the welterweight limit of 147. On top of that, Spence is considered a big welterweight. Garcia doesn’t care one iota about that or what anyone thinks, though. He wanted a challenge and he found one. And while some call him foolhardy, he has no doubt whatsoever that he will emerge with his perfect record (39-0, 30 knockouts) intact Saturday night at AT&T Stadium outside Dallas. I think his bold move to challenge Spence and unwavering confidence in himself has resonated with his growing number of fans, who applaud his unconventional thinking and pluck. Many of them suspect he has bitten off more than he can chew but they admire him. If he loses, he can say with legitimacy that he “dared to be great” – the war cry attached to him going into this fight – while some other elite fighters seem to do all they can to avoid such challenges. He will be celebrated even in defeat unless the fight turns out to be ugly in some way. Indeed, the only way for this to become truly regrettable is if Garcia suffers a particularly gruesome beating or is seriously injured. Kell Brook’s challenge of Gennady Golovkin in 2016 comes to mind. Brook moved from 147 to 160 for that fight, in which he was stopped in the fifth round and suffered a broken right eye socket. Brook’s subsequent fight? Spence, a fellow welterweight who some say punches like a middleweight, stopped the Briton in the 11th round and broke his LEFT eye socket. Garcia isn’t Brook, though. And he isn’t Amir Khan, who moved from welterweight to a catch weight of 155 to face Canelo Alvarez the same year and suffered a predictable one-punch knockout. Garcia is better than Brook and Khan – he’s on everyone’s pound-for-pound list – and certainly more resilient. Plus, Spence isn’t as advanced as Golovkin or Alvarez, two strong, skillful veterans who had proven their mettle over a long period time. That’s why almost no one gave Brook or Khan a chance to win those mismatches, which isn’t the case with Garcia in his fight on Saturday. Spence is around a 3½-1 favorite, which is substantial, but more and more people seem to believe the underdog will be competitive or even pull off a surprise. I predict Spence will win, perhaps by knockout, but I believe Garcia is too talented and too experienced to go down without giving Spence some problems. If Garcia beats Spence? He becomes a legend. And that concept is not far-fetched. Spence appears to have all the tools to become a superstar – ability (he was a U.S. Olympian in 2012), speed, athleticism, power, all of it. That’s why so many are so high on the 29-year-old Texan. The only problem is that he hasn’t proven himself to the degree of many elite fighters. Brook is the best fighter he has faced and the Briton was coming off that bad beating against Triple-G, after which he had to drop back down two weight classes. And while knockout victim Lamont Peterson is well known, he also was well beyond his peak when he faced Spence. Spence’s resume is thin after that, which means we really can’t be certain about how good he is. He seems to be special but we won’t know for sure until he proves it against two or three more elite opponents. Spence is a test for Garcia but the opposite also is true. Garcia arguably already has a Hall of Fame resume, with major titles in four divisions and victories over Orlando Salido, Juan Manuel Lopez, Roman Martinez, Adrien Broner, Robert Easter Jr. and several other big-name opponents. In other words, we know what Garcia can do. And he can do a lot. No one in the sport has tighter technique than the Southern Californian, who has outclassed one capable opponent after another for years. And while he isn’t a knockout artist at higher weights, he has heavy hands that wear down the opposition. Is it possible we’re putting too much focus on the size difference? I think so. Garcia might simply be more talented than Spence, which could more than compensate for whatever physical advantages Spence might have. That’s obviously what Garcia is thinking: He’s too good for anyone, including this big, formidable opponent. I hate the idea of Garcia losing his perfect record in a fight he arguably shouldn’t have taken. At the same time, I’ve railed for years against the overemphasis on maintaining zeros in the loss column. Almost all of the greatest fighters in history have lost – Robinson, Ali, Louis, Leonard, Duran. The list goes on forever. The unbeaten Floyd Mayweather might’ve been remembered more fondly had his record been imperfect, which would’ve been an indication that he had taken more risks in his career. Fans are inspired by risks, both in choosing opponents and in the ring. That’s why their inspired by Mikey Garcia.